Dig, Grow, Compost, Blog: Patrick, what'll I do with ya? Patrick, what'll I do with ya? I've been woefully neglectful of my blog this month. Getting a cold that has lasted an eternity has been the culprit. Of course, that didn't stop me from going to Austin last weekend. It should've though. Imagine visiting friends but losing your voice and being unable to talk with them?? But enough of that. I managed to visit one of my favorite nurseries while in Austin - Barton Springs Nursery. They always have so many healthy plants, a great variety of them, and knowledgeable staff. I had a list this time. I hoped a list would keep me on budget. For the most part it did but then I saw.... Patrick. Patrick's Abutilon, Abutilon hybridum 'Patrick's' to be precise. My, was he a looker. So daring, so delightful. How could I pass up his charms? The red veining on the bright orange, like some bold, devil-may-care butterfly. I was a goner. So I brought him home. Jean, I'm glad to hear you had a nice visit to Austin and to one of my favorite nurseries. There's been a flutter of email and comments in Austin lately about pruning abutilons, and the consensus seems to be that you can prune them hard, once established, to keep them at a manageable size. My own abutilons are new this year, however, so I have no direct experience to share with you. Wow! It is a stunner! This is the reason I rarely visit nurseries - too much temptation! I haven't kept abutilon in your climate, but I did have one(in a pot) many years ago when I had a conservatory in which to keep it. It was pruned and kept to a nice shape, but was much smaller than yours and not as pretty. Pam - thanks for the info. I think I will let it do its thing this year and then try to keep it pruned back. I'm assuming they should be pruned in late winter/early spring?? Patrick's very handsome indeed! I have Marilyn's Choice in a pot on one patio while I continue cogitating about where to put her. Hey, I saw your comment over at Mr. Brown Thumb's site asking about resizing header photos on Blogger. I've done it using one of the photo editing programs on my computer; save it in the size you need it to be for your header and then upload it. Thanks for the tip Cindy. I'll give it a try. That is a beauty! I just discovered abutilon a few years ago and I love them. I hope you get to feeling better soon! That is a really nice one. I'm in Z5 and had one as a standard topiary for a couple of years in a container and I trimmed it to stay about 4 feet tall. I really like the colors of yours. 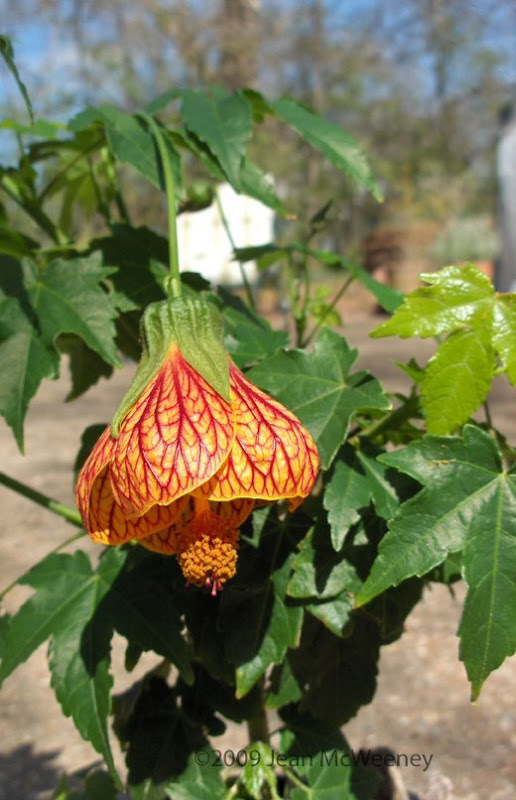 I had this abutilon in SE Louisiana. I just popped it in the ground in the wettest part of the garden and let it go! I found it needed trimming back (would get a bit unruly), but seemed to thrive on it. Best for me: the hummers loved it! They'd get nectar from the petal base of the flower and would go from bloom to bloom to bloom. One of them got a bit territorial so I got a pink abutilon to go with my Patrick. Hope you enjoy yours as much as I did mine! Thanks for the info Jean!